As 2013 unfolds, it’ll be interesting to see where this year heads in terms of real estate. Everyone and their Mom has predictions and strong beliefs of course, but we’ll see how things pan out. One of the groups I do think we should continue to watch closely this year though is Blackstone (THR California). Since entering the market very strongly last August, they set themselves apart as the most aggressive hedge fund buyer in the Sacramento area (so far), which makes it important to see how their strategy plays out. Icebergs & Prices: The market under $200,000 has been a prime target for investors, so this graph is no surprise. In fact, the price focus of THR California / Blackstone so far reminds me of an iceberg. Just as the vast bulk of an iceberg is under the water, with only a smaller portion above water, 81% of the purchases by Blackstone have been under the $200,000 level, with only 19% above that mark. I know iceberg purists are going to tell me icebergs are usually estimated at about 85-90% below water, but hey, it’s similar enough to get the point here, right? Sharing Images: You are welcome to share any of these images on your blog, website or in a presentation. Please keep the image intact (unaltered) and provide a link back if online. See my sharing policy for details. I’ve also included a larger thumbnail image to the right in case it’s useful. Simply click the image and then save to your files. NOTE: The graph above is based only on information provided from Tax Records / Realist. 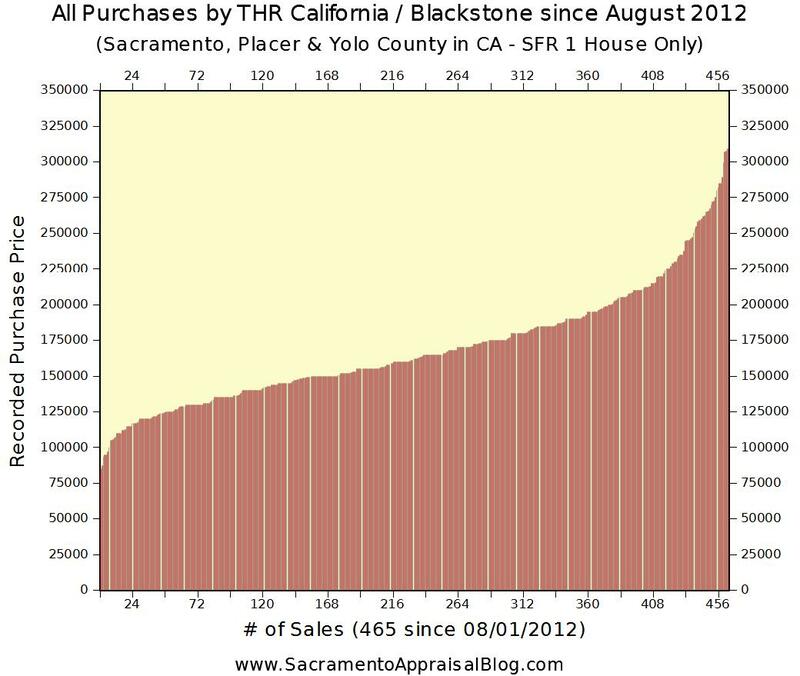 As of 01/22/2013 there were 465 sales in the name of “THR California” since August 1, 2012. Blackstone is not new to the market of course since they do own almost 900 properties in the Sacramento area that they’ve purchased through the years, but the rampant purchasing over the past two quarters has really increased their local holdings. Some sources indicate they have purchased far more than 465 sales over the past months, though I am only going by what I see in Tax Records. If someone else has another source, speak on. Questions: What do you think is going to happen to the market under $200,000 this year? What dynamics are you seeing play out during every day real estate transactions? Wow! this is EXCELLENT and impressive information Ryan! It definitely puts a perspective on the market. In my opinion a recovering market needs investors to take on the heavy rehab properties. They typically come in under value and hopefully home sellers are looking for top dollar on the clean homes which allows for a healthy exchange. Regardless someone has to buy the boarded up properties sitting vacant. I realize that’s not all they are buying. It is keeping our market very competitive and tough for first time home buyers in that price bracket, but I feel they are buying different properties. Furthermore, they’re paying cash, so it’s not like they’re going to default on their loans and make the market crash. This is amazingly thought out info Ryan, great work!!! Thanks so much Jennifer. I appreciate it. The cash stats for 2012 are incredible to me. I am baffled by how much cash came into the market. You’re right about the boarded properties needing buyers. Also, it’s very true they are not just buying distressed inventory. I’ve seen them purchase newly flipped properties on MANY occasions too. Ryan, good information. I just got some inside information that effective 2-8-13, THR will be easing up on purchasing properties in Sacramento and focusing on Denver. This will help us buyers agents be able to compete more fairly on properties under $200,000. Thanks for the info, Edgar. I appreciate it. I’ll be curious to see what “ease up” means. Did your source say whether that means exiting the market altogether or simply pulling back to be less aggressive? There will be many happy buyers and agents if this does pan out. Ryan, from what I understand is that they will “ease up” and not be as aggressive as they have been. Thanks Edgar. Let’s watch closely to see what happens. Friends at the courthouse steps say they have been less aggressive there lately. They’ve still been buying, but they’re not buying everything.